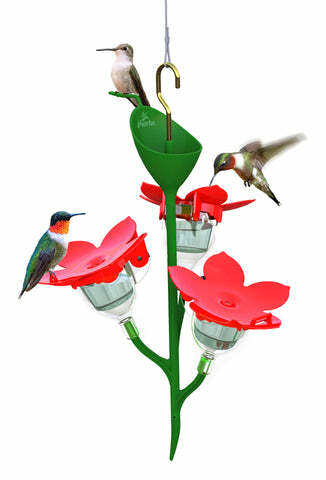 Welcome to the world's easiest system to care for hummingbirds: the patented Allura 'Pod System'. No more cleaning your feeder. Leave the feeder outside. Take the nectar to the feeder. It's fast! It's easy! It's beautiful! Your Allura feeder comes with three (3) removable feed pods. When the nectar gets old or dirty, simply remove each feed pod and wipe clean with your finger tip and a paper towel. Place the feed pod back in the feeder and refill. Cleaning is done! You never need to clean the feeder itself, only the feed pods. Your new Allura includes a squeeze bottle and a funnel. Store your nectar in the squeeze bottle in the refrigerator. When it's time to refill your feeder, grab the squeeze bottle and head outside. Simply aim and squeeze!